Pictured: Governor John A. Burns and Dean Jerris Hedges. Graphic by Deborah Manog Dimaya. Understanding the hardships and the hurdles our MD students overcome and the sheer determination, persistence and excellence they demonstrate, Hawaii has every reason to be proud of its sons and daughters, and the school that gives them the opportunity to train and serve their community as physicians. At the medical school named after John A. Burns, Dean Jerris Hedges leads by listening far more than he speaks. During his decade at the school’s helm, his closest advisors have included the late James S. Burns, the Governor’s son, and a small army of others whose voices are essential to the unique UH medical school coalition — the community hospitals where our students and MD residents and fellows train side-by-side with faculty physicians, our governmental leaders who lend support to our mission and the public whose health needs we seek to meet, whose children we seek to train for a sustainable future, and the university which guides us. In ten years, the Dean has expanded the entering MD Class size by ten students without approvals for additional faculty or classrooms. He has overseen a phenomenal growth in philanthropy —including giving from within the school — including the three-part gift that gave nearly 1/3 of the most recent class a tuition free four years. He wants to repeat and expand that feat, dreaming of free medical school in a state where physicians are so desperately needed. Under his leadership JABSOM academics, performance in primary care training and research has received impressive marks in national rankings from U.S. News & World Report, and in comparisons with our peer institutions. He has successfully lead JABSOM through two primary medical school accreditations, helped build a strong faculty practice plan, and expanded graduate MD education to neighbor islands. Months before he died in 1975 Governor Burns was asked if he still believed a medical school was necessary for Hawai’i. “I believe in a medical school and I believe in a law school,” he replied. “I also believe our kids are not going to get a chance to go to either one of them unless we have our own.” John A. Burns, February 1975. TS: Over the years JABSOM has sometimes encountered those who still question whether Hawai’i can afford a medical school, much less expand it, as you feel is necessary. What is your response? KC: How can you continue to grow the medical school to help the University meet the state’s pressing health workforce needs? “In 2018, data clearly shows that while JABSOM students do well in their medical school progression, national board scores and their residency placement (their ability to match into advanced training programs), compared with other US medical school students, they get fewer invitations to interview at medical schools, they come from families of lesser incomes, and they have to wait longer after college to get into medical school – usually because they are waiting to get into JABSOM, where class size is limited.” Jerris R. Hedges, MD, JABSOM Dean. KC: What will it take to achieve that? KC: That should keep you busy for the foreseeable future. Taking a step back, do you have any advice for future deans? Student questionnaires conducted at medical schools nationwide on behalf of the Associate of American Medical Colleges (AAMC) in 2018 show the hardships, the hurdles to overcome, and the sheer determination and persistence required of and demonstrated by our JABSOM students. Hawai’i has every reason to be proud of these sons and daughters, and of the school that allows them the opportunity to serve their community as a physician. What are these difficulties our students overcome? 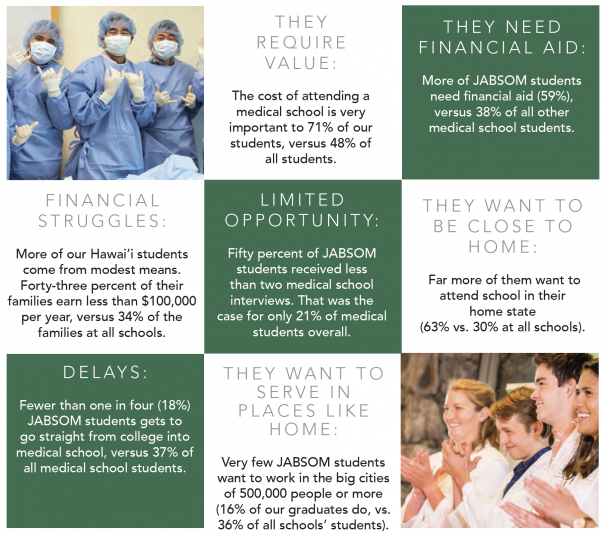 Delays: Fewer than one in four (18%) JABSOM students gets to go straight from college into medical school, versus 37% of all medical school students. Limited Opportunity: Fifty percent of JABSOM students received less than two medical school interviews. That was the case for only 21% of medical students overall. Financial Struggles: More of our Hawai’i students come from modest means. Forty-three percent of their families earn less than $100,000 per year, versus 34% of the families at all schools. They require value: The cost of attending a medical school is very important to 71% of our students, versus 48% of all students. They need financial aid: More of JABSOM students need financial aid (59%), versus 38% of all medical school students. They want to be close to home: Far more of them want to attend school in their home state (63% vs. 30% at all schools). They want to serve in places like home: Very few JABSOM students want to work in the big cities of 500,000 people or more (16% of our graduates do, vs. 36% of all schools’ students).